Folding for Good for Franklin Regional*: Keep on going, people care! 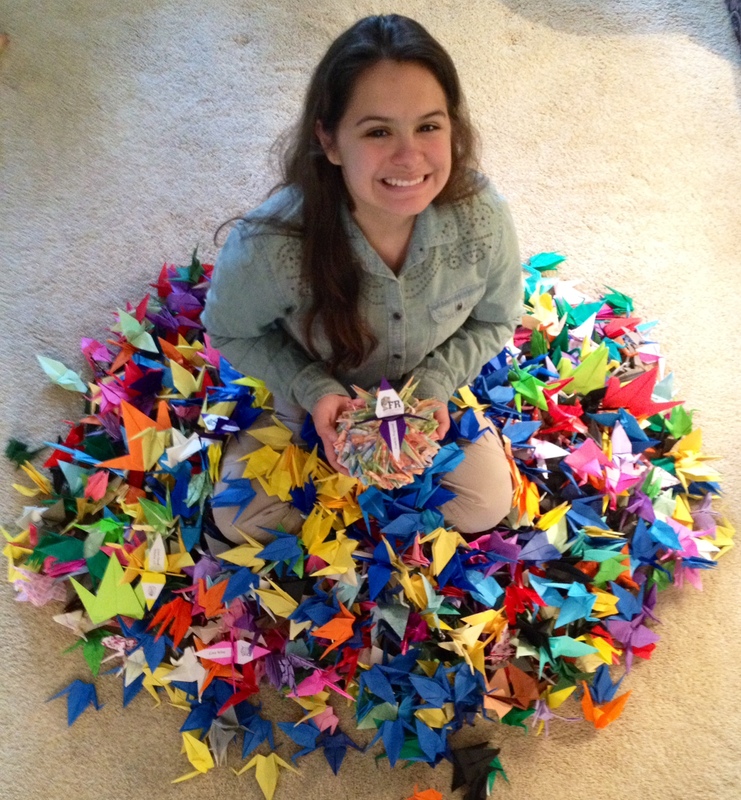 On Wednesday, June 4, 2012, I will present Franklin Regional High School Principal Ronald Suvak and his staff with around 3,700 strung paper cranes in support of the school community which was rocked on April 9 when a sophomore student went on a “stabbing and slashing spree” injuring 20 students and a security guard. Folding for Good for Franklin Regional is our initiative to join with other paper folders to create 1,000 paper cranes for Franklin Regional. 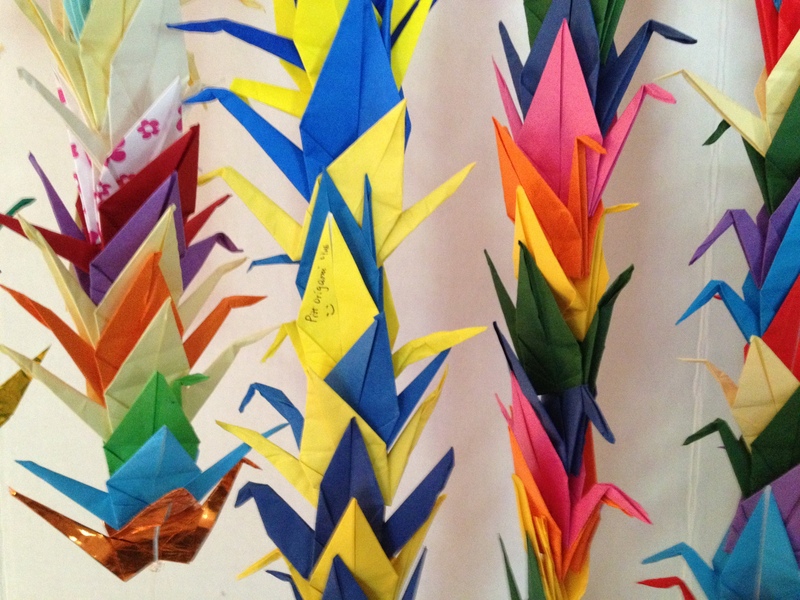 Japanese tradition suggests that the folding of 1,000 origami cranes grants the recipient a wish. Folding for Good for Franklin Regional netted 3,700 origami cranes from folders in Ireland, Germany, and eight of the United States—more than triple what we had hoped for. Thanks to everyone who supported this initiative. Each crane was donated and the folders themselves footed the cost of postage to Pittsburgh. Student organizers put up tables in school cafeterias, libraries, GATE classrooms, and Girl Scout meetings. Other students hosted “fold-ins” at their homes. The Pitt Origami Club folded cranes at their last meeting of Spring term during finals week. 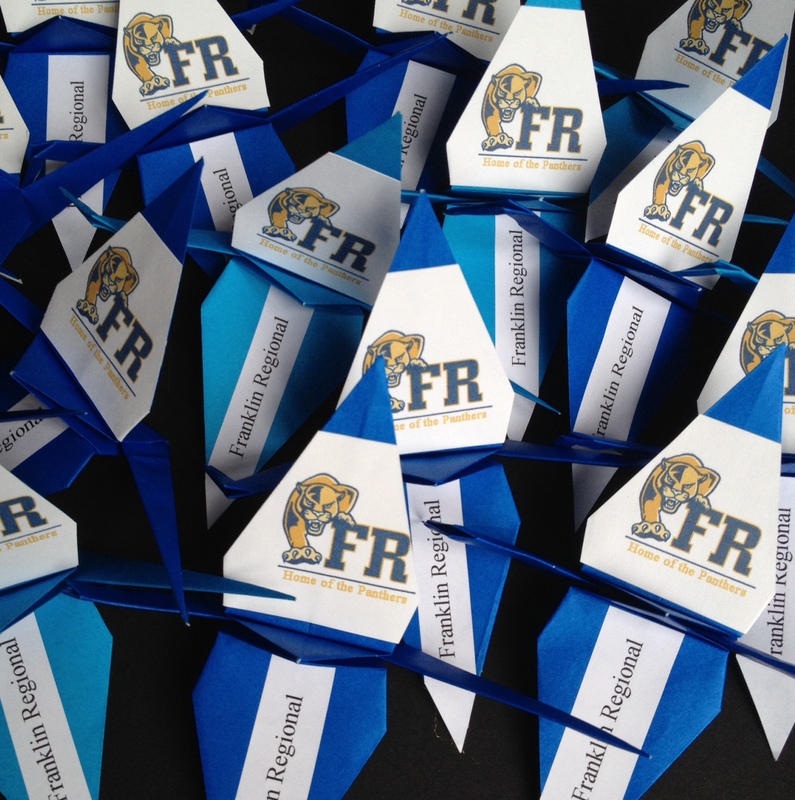 Individuals created original centerpieces and Franklin Regional Panther logo cranes. One complete, matched senbazuru strung with faith, hope and love beads was created by a single person. Around 2,100 of the cranes came in “loose.” I ironed, fluffed, sorted and strung all; some are grouped into themes of sorts: there’s a “doodle strand,” strands in Franklin Regional school colors, matching pair strands of big and little cranes, the message strand, floral strands, and plenty of colorful rainbow strands. I ordered some custom stickers for the tails of the many completed strands. Keep on going, people care. Each faculty member will receive a specially strung crane or crane pair with a note explaining this initiative, and there will be around 22 extras in case those who were injured would like one. And so will end the eventful school year at Franklin Regional Senior High School. Thank you all. We have done something good. *Folding for Good for Franklin Regional is coordinated by Calista Frederick-Jaskiewicz, Founder & CEO ofOrigami Salami and Folding for Good, which currently comprises 16 chapters on four continents. Origami Salami is a student movement mobilizing people as advocates for STEAM studies through the fun of origami; Folding for Good is an initiative to engineer creative ways to Do Good with it. This entry was posted in Art, Community Service, Franklin Regional, Math, Origami, Science, STEM and tagged Calista Frederick, Calista Frederick-Jaskiewicz, crane, Cranes, Folding for Good, folding for good for franklin regional, franklin regional, Franklin Regional High School, franklin regional senior high school, origami crane, origami cranes, Origami Salami, paper crane, paper cranes, Pitt Origami Club, Pittsburgh, University of Pittsburgh. He Does It Again! Owen Byrne, Origami Salami Ridgewood(Queens) New York City, folds 1,000 Origami Cranes, for Folding for Good!